Neglected bananas are a sorry sight. I had three of them in my fruit bowl this morning and they were at an advanced stage of ripeness; way past speckly-brown, they were completely black, and were beginning to go moldy on the outside. I was about to throw them in the bin, but out of curiosity I peeled one open to have a look, and it seemed fine, if a bit sticky and caramelised. They would be perfect for banana bread. I’m quite particular when it comes to bananas as a snack; for me, they must be only just ripe; the greenness gone but still slightly firm inside. That’s a perfect banana. When a banana passes this stage, I’m pretty disinclined to peel it open for a snack. I think subconsciously I know I can make banana bread if I wait for it to go soft sticky, and overripe, and it doesn’t have to go to waste! 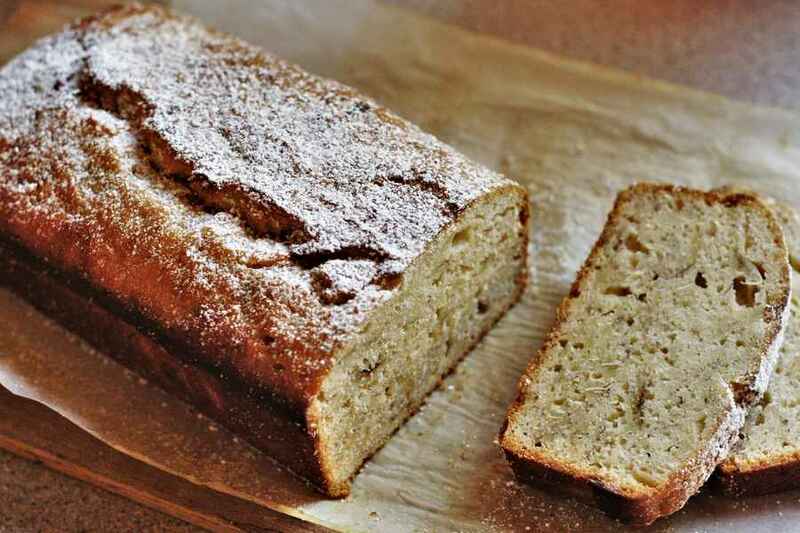 I’ll admit; I actually prefer banana bread to a banana on its own. It’s not quite as healthy, I know, but that’s rarely a priority for me. It tastes better, and that’s what really counts. Heat the oven to 175C and line a 1kg loaf tin with baking parchment. Place the butter, sugar and vanilla essence in a pot and melt over a medium heat, stirring frequently. Add the bananas and egg and mix. Now add the flour and milk, and mix thoroughly to combine. Pour everything into the lined loaf tin then immediately place in the center of the oven. Cook for around 30-40 minutes. To test if it’s cooked, insert a skewer into the centre of the loaf; if it comes out with no raw batter stuck to it then it’s ready. Remove from the oven and cool on a wire rack. Use a small sieve to dust the top with the icing sugar.